ApproveMe’s WP E-Signature transforms any WordPress website into a secure, legally binding and customizable document signing application (but without the monthly fees). 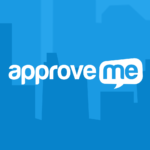 ApproveMe is focused on simplifying (and automating) the document signing process. Our unique UETA/ESIGN compliant document signing process allows us to save businesses hundreds of dollars a year by transforming one page of their website into a secure document signing application. WP E-Signature, our new WordPress plugin is the most powerful and easiest to use E-Signature plugin ever created. We care about small businesses. Our top priority is to ensure business owners get the best deal when signing documents.